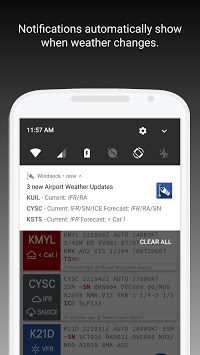 Windsock automatically downloads and notifies users of new airport weather. 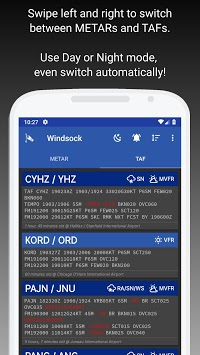 Windsock for Android is an app that automatically downloads and notifies users of new airport weather observations (METARs) and forecasts (TAFs). 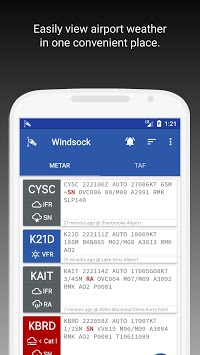 You can customize Windsock to download new METAR or TAF information for your favorite airports and optionally notify you after doing so. You can also add unlimited METAR and/or TAF widgets for all your favorite airports. Whether you're a professional pilot or weekend warrior, you can use Windsock to get the latest METAR observation and TAF forecast for your favorite airports. Use it to plan your commute! Use it to let you know when there's clear skies in the forecast for the weekend! • Easy-to-use airport lookup tool to locate your favorite airports by ICAO/IATA code, city, etc. If you receive any errors or app crashes, please email me! Comments and suggestions are welcome as well. I can be reached at android [at] iawix [dot] com - thank you for using Windsock! Interested in helping translate Windsock? Please send an email to [email protected]! INTERNET: Used to download weather data from the US National Weather Service. Also used to display advertising in the Free version of Windsock. ACCESS_NETWORK_STATE: Used to determine if device is connected to the internet before downloading data. RECEIVE_BOOT_COMPLETED: Used to start automatic updates after device boots, if notifications are enabled. VIBRATE: Used for Pro notifications. READ_EXTERNAL_STORAGE: Allows Pro users to play notification sounds that are located on the SD card.